If you saw the Dylan documentary Don’t Look Back by D.A. Pennebaker you may have come away with an impression of Donovan as a mere Dylan imitator. And if you’ve heard only hits like “Mellow Yellow” you may have assumed he’d moved on to become a Beatles imitator. Both are inaccurate. 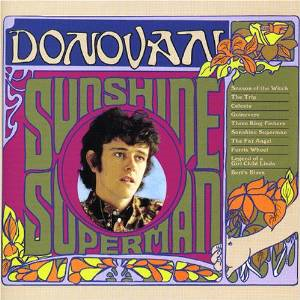 Donovan was an artist with a unique voice and diverse catalog, whose career happened to have parallels to the two most influential artists of the 60’s. Like Dylan, he began his career as a folk singer, became restless, and eventually “plugged in” to more electric and eclectic sounds. Like the Beatles, he allowed Eastern mysticism to inform his songwriting, and studio experimentation to broaden his sonic palette. It is breathtaking to hear some of the arrangements on Sunshine Superman and to realize it was recorded at least a year and a half before Sgt. Pepper. “Celeste” is a great example. A bed of organ, sitar and mellotron (Donovan used one before the Beatles or the Moody Blues) is joined in the instrumental section (2:05) by harpsichord and glockenspiel. Again: 1966. A sitar, mellotron, harpsichord and glockenspiel arrangement. On other songs it was clarinets, oboes, vibes or a small string section. This was as progressive as anything in pop at the time. Producer Mickie Most is credited with helping turn “Folkie Donovan” into “Groovy Donovan”, but Most’s strength lay in creating hits, and the truth is it was Donovan who heard the harpsichords in his head. So Most brought arranger John Cameron, who had jazz and classical sensibilities, on board to score the complex arrangements. At times it got so carried away it became Most’s job to thin out an overly ambitious arrangement, and make a commercial record. For another example of the exquisite baroque-pop sound they created–pre-“Eleanor Rigby”–check out the 7-minute “Legend of a Girl Child Linda”. Even if you don’t fully follow the song’s storyline, you’ll surely agree this is not the work of anybody’s imitator. How about Brother Son, Sister Moon? Wow, obscure stuff! Donovan fans are always welcome here.